Designed, cut by hand, and constructed using mostly vintage and antique materials. Hand-sewn using strong upholstery thread and machine stitching. 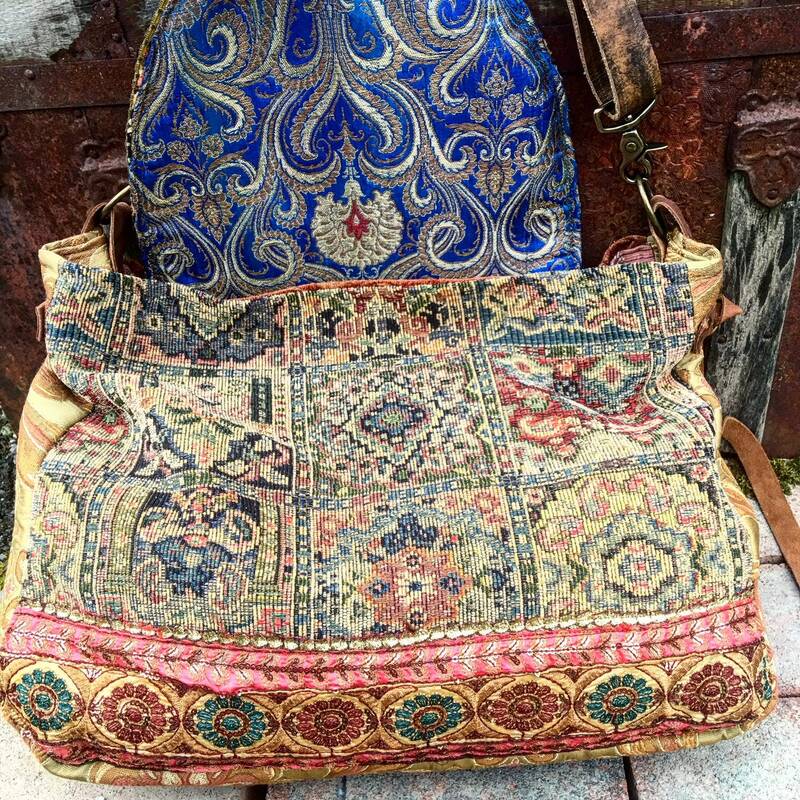 A very durable, plush bag made of gorgeous ancient fabrics, antique trims, metal hardware, genuine leather accents, lined inside with antique/vintage fabrics with a large, deep decorative pocket. 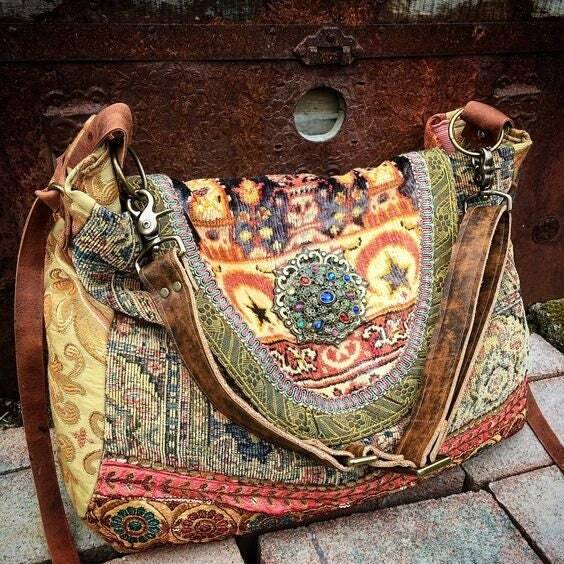 A large bag for carrying your valuables. 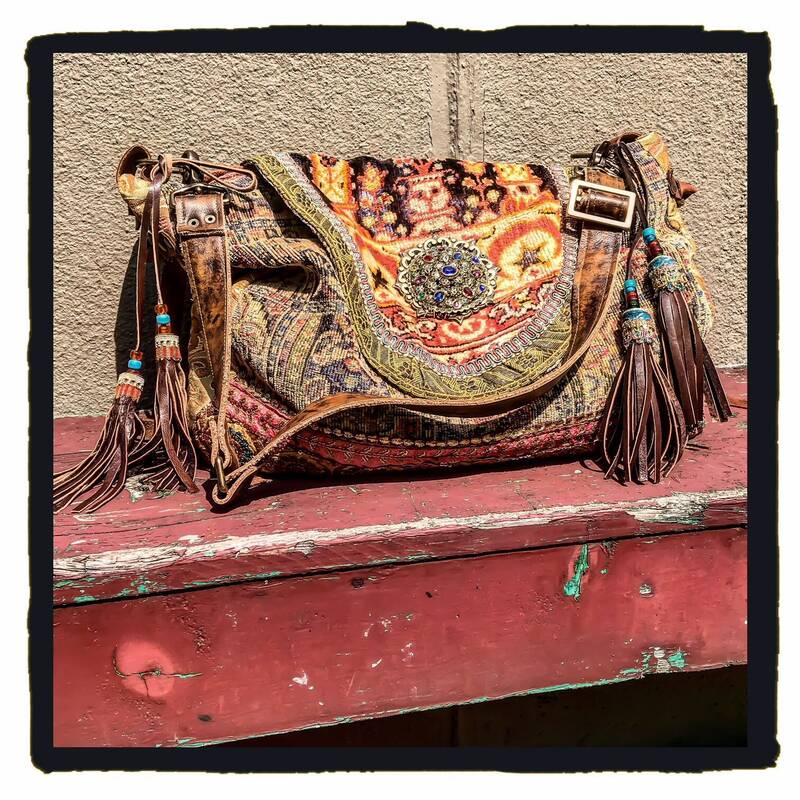 Use as a large shoulder bag, or as an exotic overnight bag! The body of the bag has a magnetic clasp to keep your belongings securely inside. 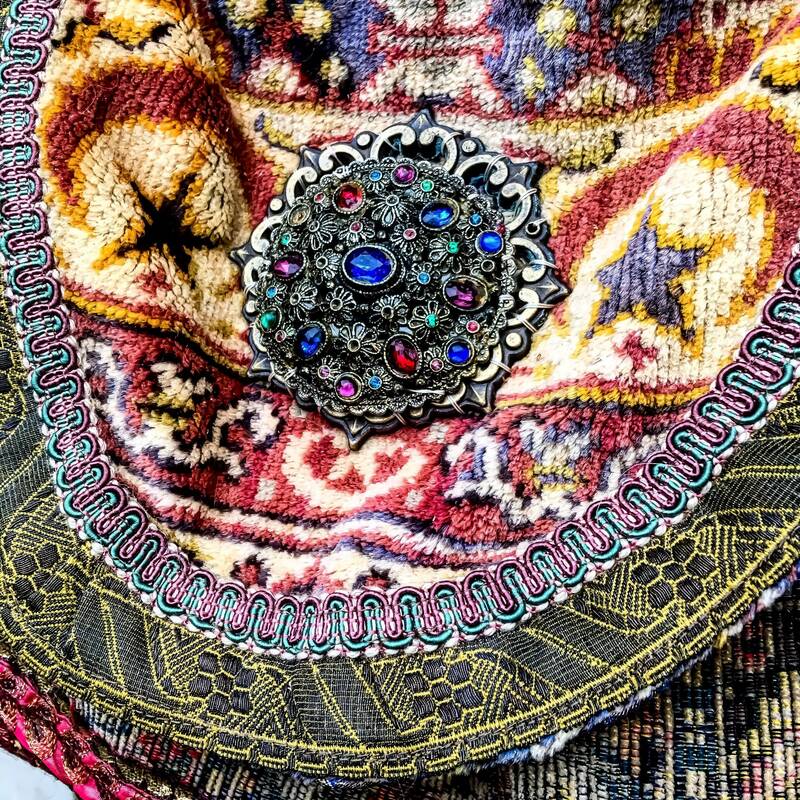 The antique royal purple silk velvet flap is lined underneath with heavy silk brocade fabric in royal blue, decorated with antique trim, and adorned with a beautiful filigree metal decoration with multi-colored crystals, rhinestones, and glass cabachons. 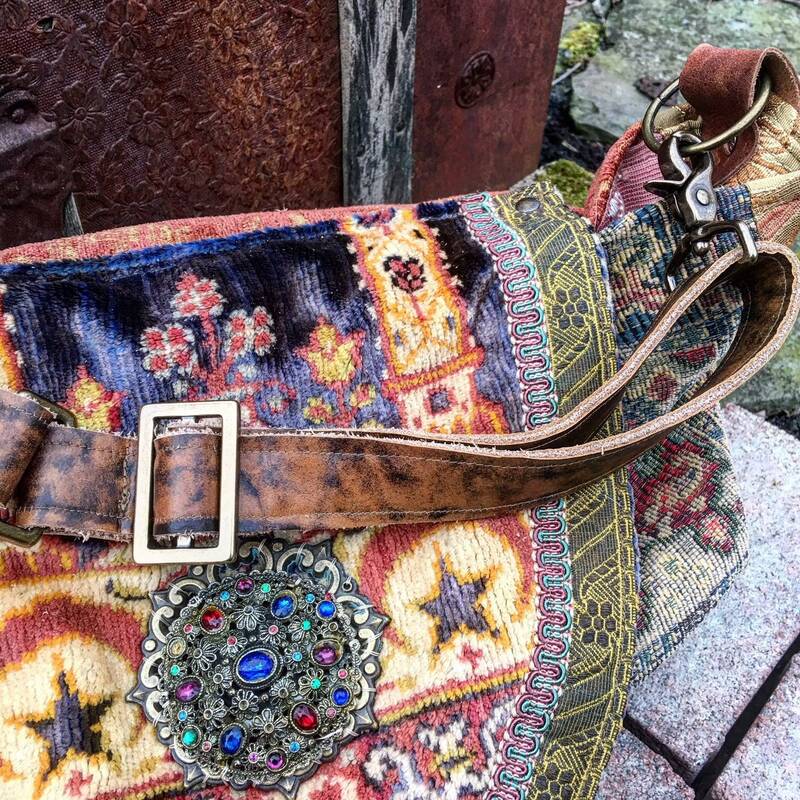 The 5 inch gusset (sides and bottom of the bag) is also made of heavy vintage brocade fabric, and the sides can be adjusted with cinches and adjustable leather straps. 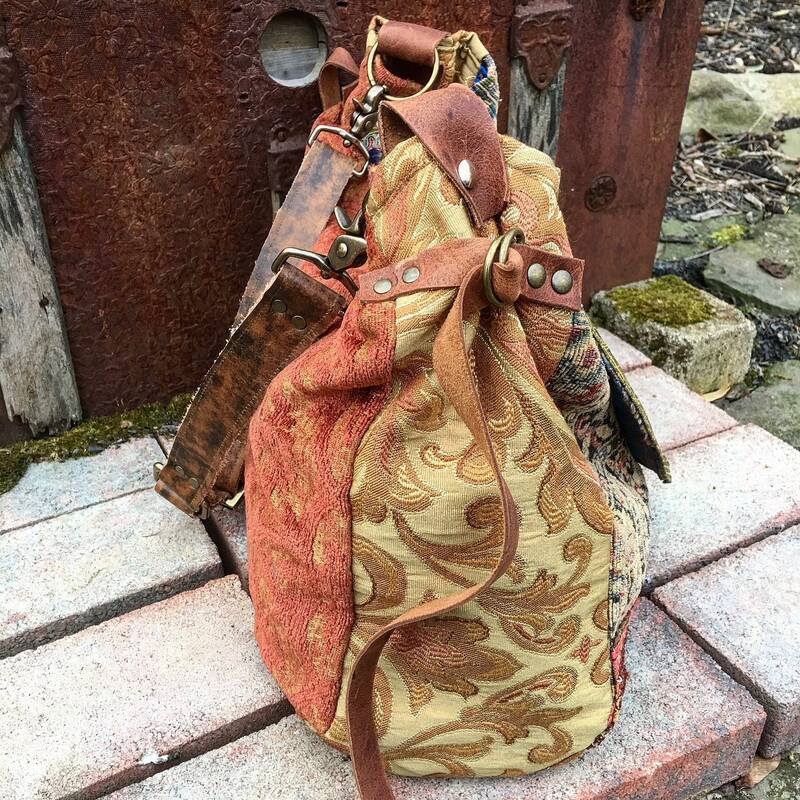 The removable and adjustable shoulder strap is made of buttery soft, distressed whiskey brown genuine leather for comfort and easy carrying with convenient heavy duty swivel hooks in antique brass. 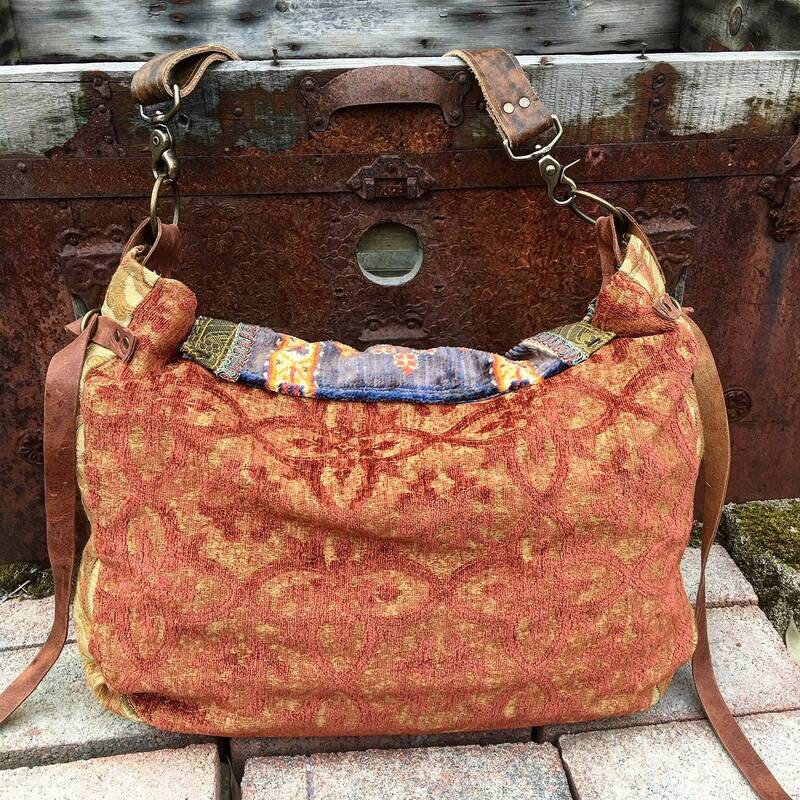 This large hobo bag can also be worn cross body due to the adjustable strap length. 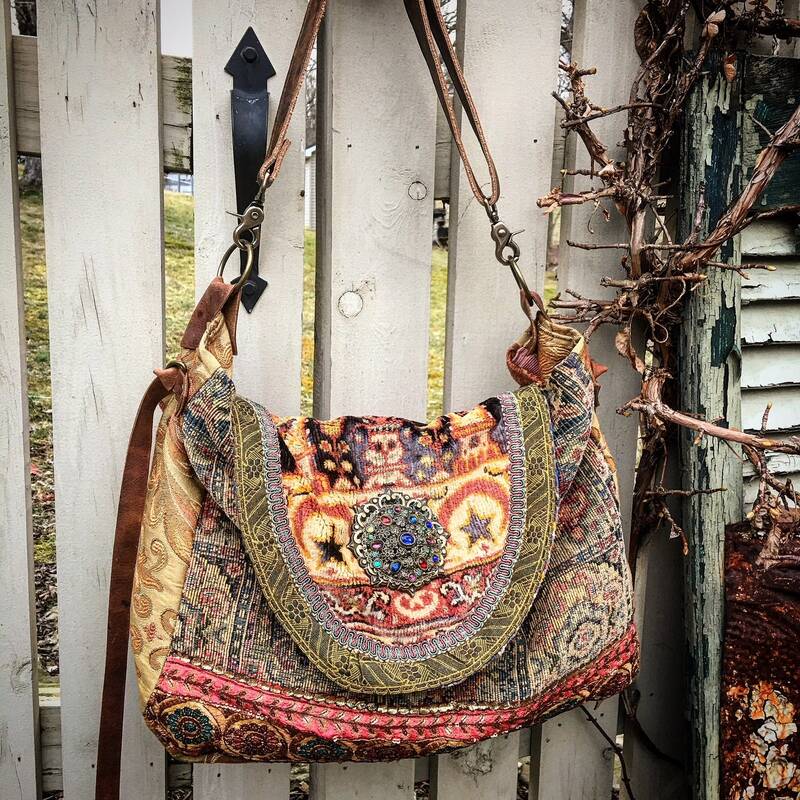 This hobo-style bag has a slouchy appearance since there's no batting inside (it will not stand up on its own). 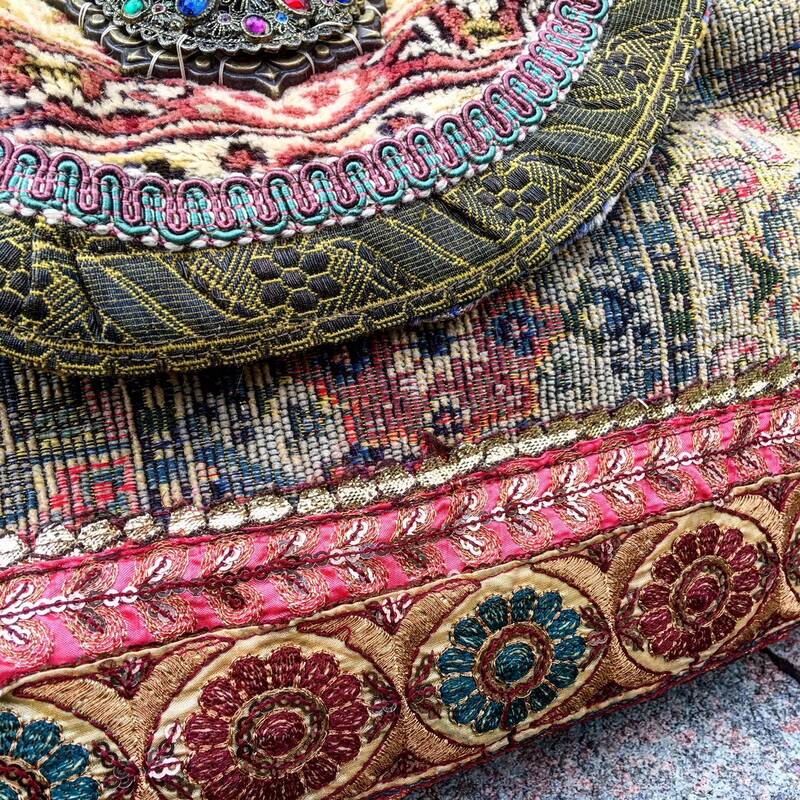 A very soft, plush, and durable bag made with exquisite materials and embellishments. A handmade treasure to last you a lifetime! Created with lots of love and imagination in a smoke-free workshop. Depending on your location, shipping within the United States is USPS Parcel Post (2-9 business days), USPS Priority Mail (3-5 business days), or FedEx Home Delivery. Your beautiful bag will be insured and require signature upon delivery. 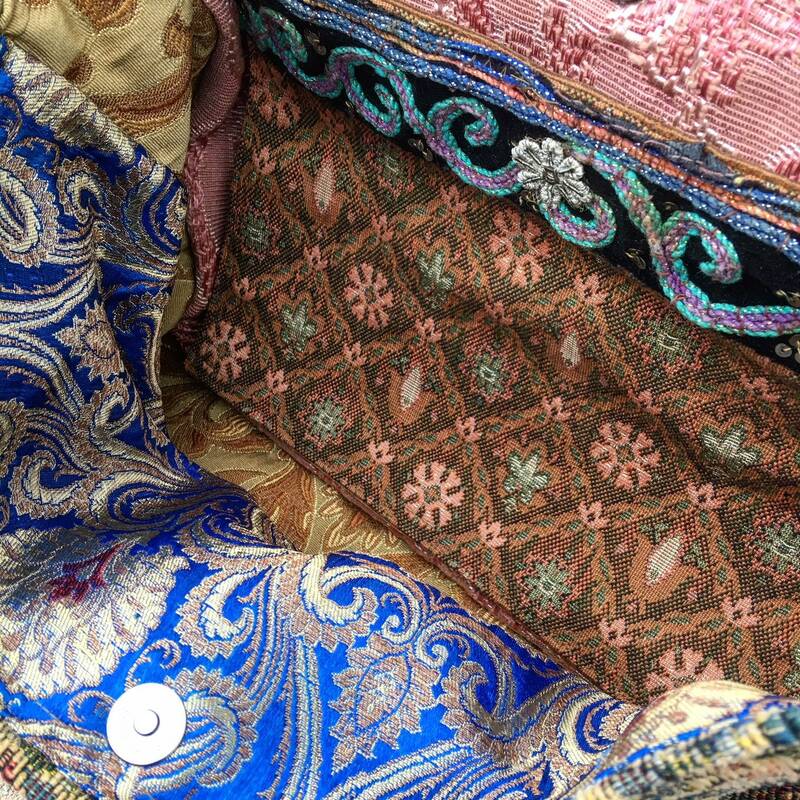 Please contact us before purchasing for exact or expedited shipping options for your area, and we'll send you a price quote.